Peek spends 68 years with company, two as caretaker president. Mr. Peek was born in Polo, Illinois on March 5, 1872. His paternal grandmother, Lucretia Lamb Peek, was a sister of Mrs. John Deere, and moved west to Illinois from Vermont in 1838 at the same time as Mrs. Deere. On the long overland trip from Vermont, Peek’s father, Henry Clay Peek, shared the same feedbox “cradle” with Deere’s son, Charles Deere. Peek attended Oregon, Illinois public schools until 1887, when, at the age of 15, he entered a law office in Barron, Wisconsin. He remained there a year, then returned to Moline to become a Deere employee. Starting with the “shipping gang”, he successively was promoted to assistant bookkeeper, order clerk and bill clerk. In 1891, he resigned in order to study law. He attended the University of Iowa and the Harvard University Law School, and then continued his study in the office of William Barge of Dixon, Illinois. He was admitted to the Illinois bar in 1894. In January 1895, Peek opened a law office in Moline and soon built up a large and successful practice. His clients included Deere & Company. During this period his work for the Company included the drafting of a workmen’s compensation system applicable in case of injury to employees. This system anticipated by several years all legislative action on the subject and was so successful that from the time of its adoption by the Company, until the legislature adopted a workmen’s compensation law, not a single personal injury suit was brought against the Company. In the fall of 1902, Mr. Peek was appointed assistant to the United States Attorney in Chicago, but resigned the following year and resumed his law practice in Moline at the request of Charles Deere. When Charles Deere died in 1907, Peek became one of the executors and trustees of his estate. Soon afterward he was elected treasurer of Deere & Company and discontinued his general law practice. He was a member of the committee which reorganized Deere & Company in 1911, and upon completion of this reorganization, he was elected a director and vice president in April 1911. 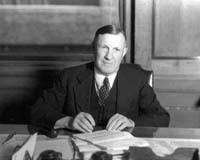 Peek served as vice president and general counsel of Deere & Company until June 15, 1942, when he became its fifth president. He served as president until October 31, 1944, when he became chairman of the board of directors, which position he held until April 24, 1956, when he retired. He continued to serve as a member of the board of directors until his death in Moline on June 14, 1960.